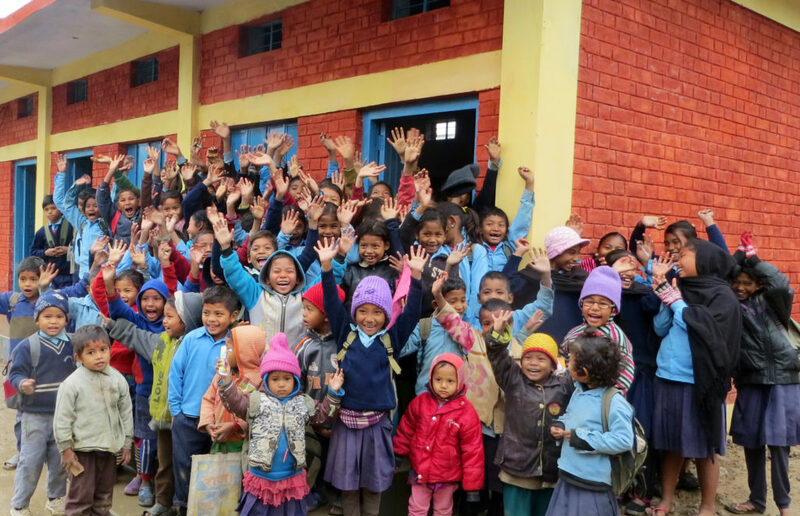 Jamunipur, the site of buildOn’s 700th school, is a remote village in the far west of Nepal. The community are members of the Tharu ethnic group, a group who were historically discriminated against as part of Nepal’s caste system. The Tharu were kept out of school and lived as Kamaiya, a system of bonded labor in which landless famers would sign an agreement with landowners to cultivate a small section of land to support their families. Deprived of education the Tharu farmers could not understand the contracts they were signing that committed them to slave labor. The Kamaiya system was only recently outlawed in 2000, which is why they value the opportunity for education all the more. In late October 2014, the community of Jumunipur joined buildOn, and American volunteers to break ground on a new primary school. Three months later, on January 5, 2015, the same villagers retired their hammers, wiped deep red paint off their paintbrushes, and took a step back to admire their finished school. They had contributed a combined 1,955 volunteer work days to complete the school. buildOn is dedicated to breaking the cycle of poverty, illiteracy and low expectations for communities at home and abroad. Each new school helps improve literacy rates in communities like Jamunipur. When more children, parents and grandparents can read and write they gain access to countless opportunities, including economic empowerment that can lift families out of poverty and support communities for generations to come. Thank you to the Bank of America Merrill Lynch Trek team for funding and helping to build this school. Photos by buildOn Trek Coordinator Lucas Turner. American school building volunteers, primary school students and villagers from Jamunipur celebrate the new school’s groundbreaking. Primary school students from Jamunipur celebrate the completion of the new buildOn school in their community. They began classes on January 25. A member of the Bank of America Merrill Lynch trek team learns a traditional Tharu dance as villagers welcome the team to their community. Most adult villagers in Jamunipur never completed or even began their education. 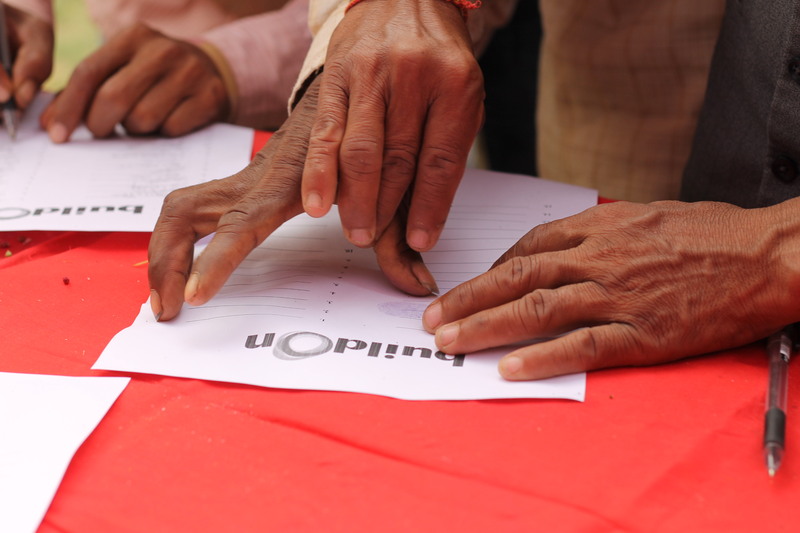 Those unable to write make their commitment to education by signing the buildOn Covenant with a thumbprint. buildOn offers Adult Literacy classes for these parents and grandparents. 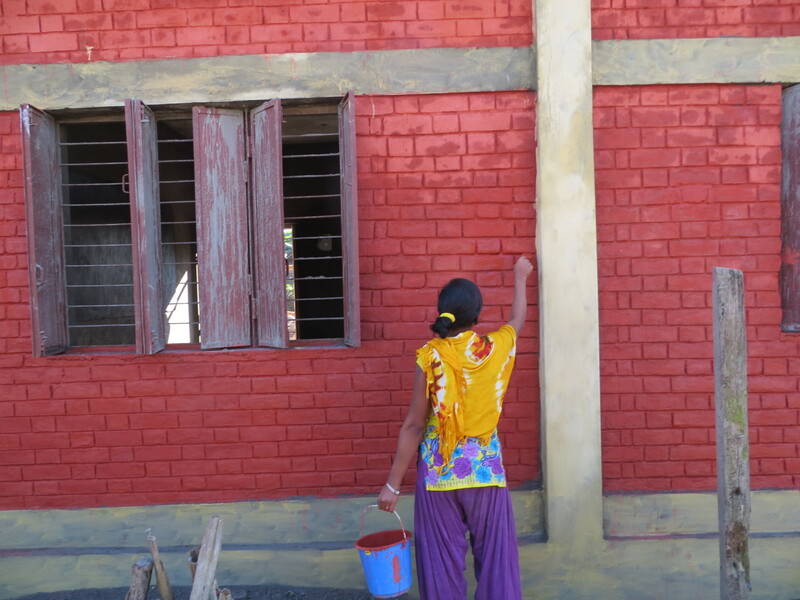 A member of the Jamunipur community helps to put the finishing touches on the school building.